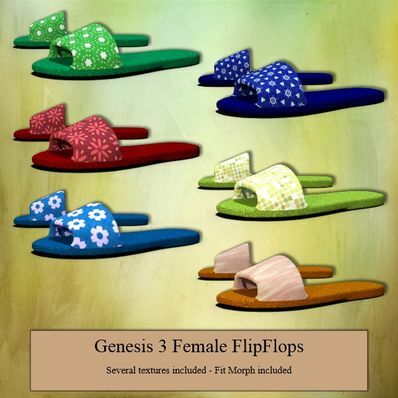 Flip Flops for Genesis 3 Female for use in Daz Studio 4.6. Just found this site, the freebies are just perfect for what I need! Thank you so much! Great - love these! Thanks. Lovely shoes! Thank you very much! I love this cute FlipFlops. Great done! Thank you so much! Thank you so much..Amazing stuff.. Very nice work the design is great as are the textures. Big thanks ! Thanks Wendy. As your season is heading towards Summer, we in Australia are heading towards Winter!! Kawaii! Thank you very much. Thanks! Very useful everyday item. So Adorable!! Thank you for all the textures! You're the GREATEST! Thanks so much great for summer outfits.